I've managed to get ZM up and running and it seems to be fantastic! I am having issues with getting motion detect working well though. I've read through the manual, wiki and other posts (https://wiki.zoneminder.com/index.php/U ... r_Dummies? ), but still am not getting the desired results. I've tried fast and best presets for high sensitive and neither are triggering well. Occasionally it will catch a car going down the road. 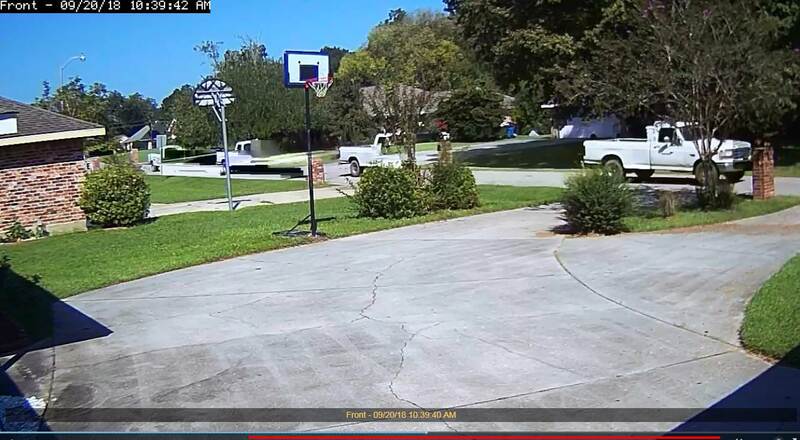 I was watching and saw the mail truck arrive at my mailbox while another car passed it on the side and a person walking a dog was all in the zone and ZM did not trigger. Can someone tell me what I might be doing wrong? Thanks for your time and patience. Well it seems my settings may be working a bit better after all. I'm now getting captures but it's mostly the trees/bushes blowing in the wind. I'm guessing if I twiddle with something in the settings it will decrease that sensitivity. Can someone tell me where the best modifications should be made? 1) Do not rely on the presets for outdoor cameras. 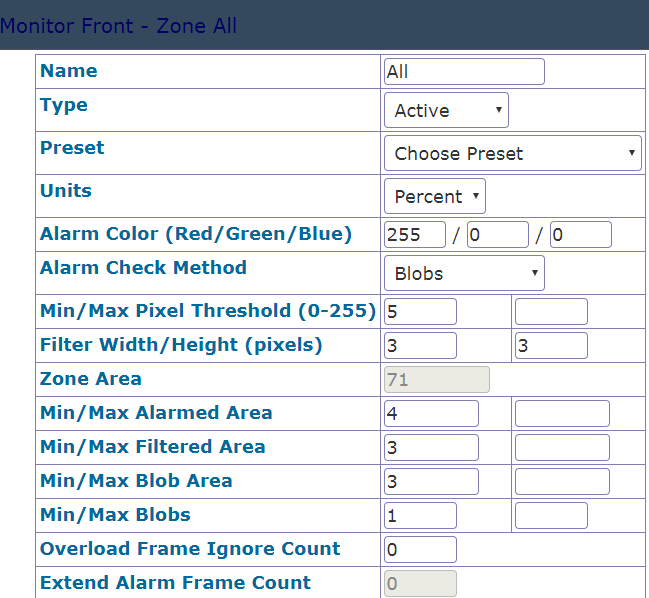 Plan on configuring the motion settings by hand for every outdoor camera. 2) Assuming the objects of interest are on the ground, don't point your camera at the sky. Assuming you want to capture the cars in the street, lower the camera's field to the level of the soffit on the house on the left. 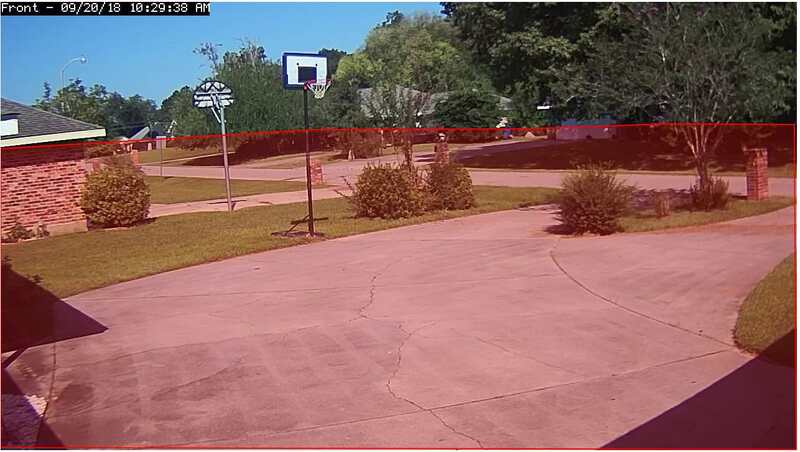 Even though you have currently excluded the upper portion from motion detection, that upper portion will still affect how the camera adjusts to changing light levels (sun, moon, that street light, etc), and that will indirectly affect how well motion detection works. 4) Recommend you set your ref image blend % to 12. Setting it too low, like you have it set now, tends to create events that never end, especially when the camera is outdoors. 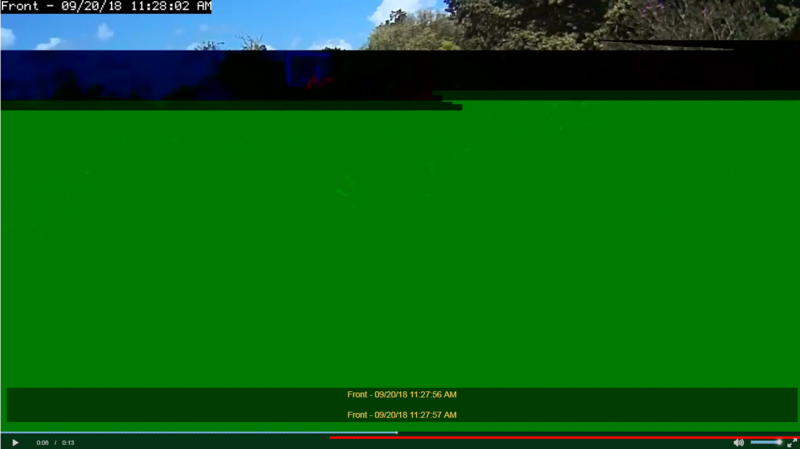 5) Search the forums for the infamous ffmpeg smearing problem. We get the same question every week. Seems you found one of the links that talks about it so just do what it says. The first thing to do is set your transport to TCP. In addition, increase the rate at which key frames are sent. In your camera, change the key frame interval from 10 to 3, so that you get a new key frame approx every second. 6) Setting your pixel threshold low is good for initial testing purposes because that will cause zoneminder to generate motion statistics for virtually everything. That will give you an idea of how many pixels are changing when the trees blow, for example, which allows you to set your Alarm Areas to a value a little bigger then that. Normally, I run a pixel threshold of about 20 everywhere. That usually works for me. One other thing, I recall Wide Dynamic Range (WDR) setting on cheaper cameras can also be a source of ghosting or smearing around moving objects. If the camera in question has this setting, either lower the value or turn it off. The side effect to this is areas in the shadows will be under exposed. You may have to strike a balance. Thanks for the tips. This is fantastic! I was able to set up my zones around the bushes/trees so that should be good now. The only other thing that I'm struggling with is clips that are too short. I'm seeing videos of cars passing on the road that stop when I know the car continued down the road and then out of frame. I'm not sure why this is happening as I'm sure that motion has continued. I've tried increasing my post event image count in the hopes of extending the clips but I'm still seeing the 'action' truncated. I'll keep digging on this one, but ZM is very close to replacing Blue Iris for my needs and I'll soon be able to power down that windows box. Thank you for your help and guidance. See the documentation about the image buffers. You need to set a pre-event buffer and a post event buffer. The values are in frames. I usually go with 5 seconds pre and 5 post so do the maths to convert seconds to frames using the frame rate of your camera. Also keep in mind the overall image buffer must be greater than the pre event buffer. This is all in the documentation. Once your buffers are set, then that's when you should start lowering the Min Area fields until you capture the events you are looking for. This is a tuning process that will often require you to strike a balance. Making things really sensitive will record cards going down the street but it will also cause false triggers when the wind blows, light level changes, weather changes, etc. Oh, and while it is somewhat easier to work in % area, changing your units to pixels will give you a lot finer control. Thanks again for these tips and explaining these things to me. ZM is REALLY powerful and I'm actually enjoying discovering how to best use it. I am using percent right now and will try to wrap my head around using it in pixel mode. All the best to you.